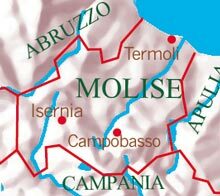 Tied for centuries to the customs and cuisine of neighboring Abruzzo, to which it was united politically until 1963, Molise is a pristine region with a peasant cuisine founded on the timeless Mediterranean duet of wheat and vegetables. Chili and garlic lace nearly every dish, as does Molise's golden olive oil. Wild and cultivated herbs like fennel and rosemary lend a deep fragrance to roasted rabbit, suckling pig, and lamb, and seafood from the short stretch of the Molisano coastline is often cooked into hearty soups and served atop toasted garlic-rubbed bread. Bakers in Molise make many versions of focaccia: some topped with potatoes, others with cracklings, others still plain and dusted simply with salt. 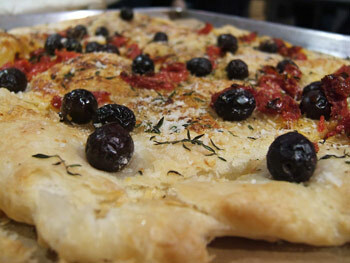 This focaccia (or pizza, as it would be called in Molise) is embellished with sun-dried tomatoes, olives, and herbs, and makes a lovely appetizer served in wedges with baby greens in a light olive oil and lemon dressing. Mix the flour, yeast, sugar, and 1 tablespoon of the salt in a food processor. With the motor running, add enough warm (110°F) water (about 1 and 1/4 cups) to make a soft dough that forms a ball. If the dough is dry, add a little more water; if it is sticky, add a little more flour. Process 45 seconds, or until smooth and satiny; transfer to an oiled bowl and shape into a ball. Wrap and let rise at room temperature until doubled, about 1 hour. Transfer the dough to a generously oiled round 18-inch pizza pan and push with your fingers until it extends to the sides of the pan (you might need to wait 5 minutes for the dough to relax and stretch more easily). Pour the olive oil over the dough, spread to the edges, and dimple with your fingers, using the pads rather than the nails so you don't tear the dough. Season with the remaining 1/2 teaspoon of salt. Top with the olives, sun-dried tomatoes, and oregano. Let rise at room temperature 45 minutes. Meanwhile, preheat the oven to 475°F (preferably with a baking stone in it). Slow-cooking canned chickpeas yields delicious results. In Molise, dried chickpeas are traditionally used; but the overnight soaking and lengthy cooking time mean this cannot be a spontaneous, raid-the-pantry sort of dish. I find canned chickpeas are perfectly delicious after thorough rinsing and slow cooking; they lend themselves perfectly to spur-of-the-moment cooking and simple weeknight meals. If you like, cook the chickpeas with twice as much liquid, and toss with 1 pound of hot boiled pasta and grated Pecorino for a hearty first course. Heat 1 tablespoon of the olive oil in a heavy 2-quart pot over a medium flame. Add the chili flakes, garlic, onion, Pancetta, parsley, and oregano, and cook 10 minutes, or until the onion is soft and the Pancetta is golden. Stir in the tomatoes, chickpeas, salt, and pepper, and cook for 5 minutes. Add the broth and cover; lower the heat to medium-low. Simmer 1 hour, or until very tender, stirring once in a while and checking to make sure there is always a bit of liquid in the pot. 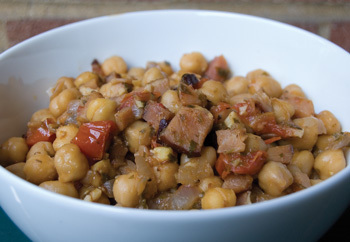 If the sauce is too liquid when the chickpeas are ready to serve, uncover and reduce over medium-high heat. This chunky soup is especially gratifying on a cold winter evening. Traditional recipes call for making your own meatballs from ground pork, garlic, minced parsley, eggs, and bread plumped in milk... but using a good Italian sausage (removing the casings first) cuts down tremendously on preparation time and turns this into a soup you can make on the spur of the moment. If possible, buy spicy Italian sausage with fennel seeds. Make the soup: With lightly moistened hands, roll the crumbled sausage into meatballs (the meatballs should be the size of a small walnut). The smaller the meatballs, the better they will integrate into the soup. 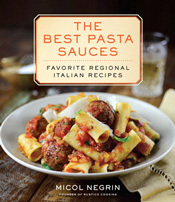 Heat the olive oil in a wide and shallow 5-quart pot and add the meatballs in a single layer. 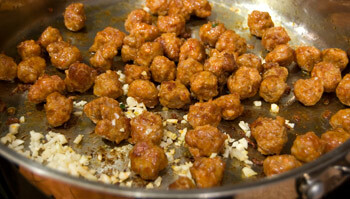 Cook the meatballs 10 minutes over medium-high heat, stirring often, or until lightly browned all over. The meatballs might still be a bit raw in the center; they will cook though later, while the soup simmers. 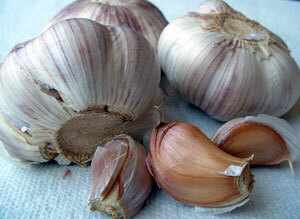 Add the garlic and cook 30 seconds. 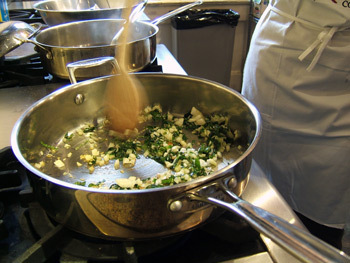 The garlic should not take on a dark color or burn at this step, or the soup will have an unpleasantly bitter flavor. 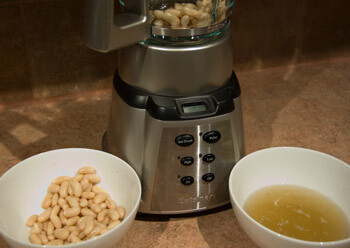 Meanwhile, in a blender, process ½ cup of the drained cannellini beans with 1 cup of the broth until quite smooth; if there are a few lumps, that won't be a problem. The puréed beans will serve as a thickener for the soup; without puréed beans, the soup will be very liquidy. Meanwhile, bring 3 quarts of water to a boil over medium-high heat in a 5-quart pot. Add the escarole and 1 tablespoon of the salt to the boiling water, and cook 5 minutes, or until it is soft; drain the escarole and rinse it under cool water to stop the cooking and set the color. Squeeze out most (but not all) of the water from the escarole. 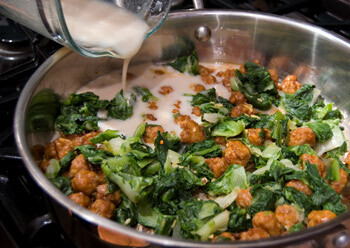 The purpose of boiling the escarole before adding it to the soup is to tame some of its bitterness and to give it a soft, silky texture. 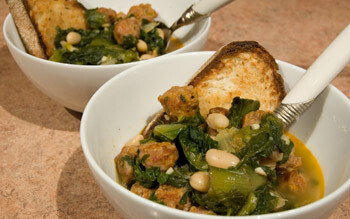 Stir the chopped escarole into the pot of meatballs. Be sure to stir very gently to avoid breaking the meatballs and cover the pot with a lid. 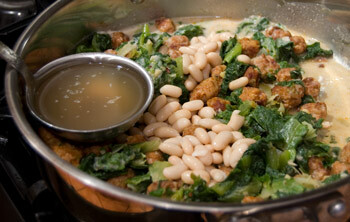 Cook 5 minutes, or until the escarole wilts and mingles with the aromatics in the pot. Add the puréed beans to the pot. Stir gently and add the reserved whole cannellini beans. Pour in the remaining 3 cups of broth and stir in the remaining ½ teaspoon of salt. Taste and adjust the seasoning if needed; the soup should be a little spicy, savory, and very aromatic. Add a little more salt if needed. Bring the liquid in the pot to a boil, then lower the heat to medium-low and cover. Simmer the soup 20 minutes, stirring once in a while. The soup should not be boiling vigorously or the meatballs may fall apart. The soup can be made up to this point up to 2 days ahead, refrigerated, and reheated gently before proceeding. To serve: Preheat the broiler. Arrange the bread on a baking sheet and broil it just until it is browned all over, about 2 minutes per side. Don't walk away from the kitchen at this point because bread tends to burn very quickly under a hot broiler! Of course, if you have a grill or grill pan, by all means grill the bread instead of broiling it. 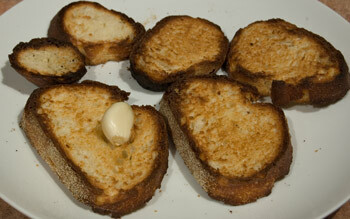 Rub one side of each slice of bread with the garlic clove. Don't overdo it, or the bread will be too garlicky and its flavor will overpower the soup entirely. You can top the bruschetta with diced tomatoes and torn basil leaves if you prefer. Heat a nonstick grill pan or an outdor grill if you have one over a high flame for 5 minutes. Grill the bread until browned on both sides but still soft inside, about 3 minutes per side, turning once. Sprinkle a handful of toasted bread crumbs over the pasta for a delightfully crunchy texture; grated cheese is never served with a classic aglio e olio preparation, but you can of course do as you like at home. If you enjoy your food really spicy, increase the amount of chilies accordingly. Bring 6 quarts of water to a boil. Add the spaghetti and salt. 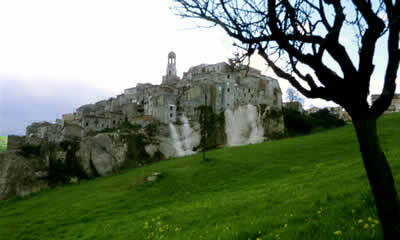 Cook until al dente, about 8 minutes; drain thoroughly, reserving 1/2 cup of the pasta cooking water.